The new Push AFO offers excellent support in the case of loss of ability to lift the foot and problems in controlling the foot when walking. The innovative design allows for a natural gait and makes safe and efficient walking possible again. The ortho Ankle Foot Orthosis is an AFO ankle brace from premium brace manufacture Push, lifts the foot during the swing phase, controls the plantar flexion after heel strike and then allows unimpeded rolling of the foot. In addition, the orthosis offers lateral stability to the ankle joint. The elastic straps of the Push AFO are adjustable. This allows the degree of dynamic foot lift during the swing phase to be determined according to the individual needs of the user. On heel strike, the restraining function of the elastic straps ensures a well-controlled plantar flexion. During stance phase, the Push AFO allows flexion and extension in the ankle joint and allows the (remaining) function of the calf muscles to be addressed during the rolling of the foot. The result is an efficient and natural gait. Where normally the shoe allows for fixation of the orthosis around the foot, the Push AFO has its own fixing strap system. This innovative construction allows the Push AFO to be used with light footwear such as indoors in slippers. The lightweight, glass fibre reinforced frame is the basis for the soft shell and functional straps which also help provide lateral stability to the ankle joint. The elastic straps control the plantar flexion after heel strike and ensure a neutral foot position during the swing phase. The innovative construction and the unique combination of functions of the Push AFO offer advantages in various usage situations such as walking on rough surfaces, getting up from a chair, climbing stairs and slopes. The advantage is in the efficient execution of the movement, the comfort experienced and the feeling of security. 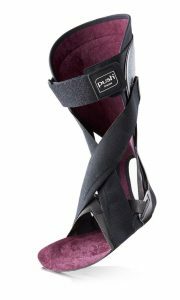 At night the Push AFO can be used as a night splint to prevent cramping or hanging of the foot. It is advised not to overly tighten the non-elastic strap system and not to close the elastic straps crosswise but to close them loosely along the side of the leg. Loss of control of the ankle dorsi-flexors during swing phase and during loading response (heel strike / foot flat), possibly with ankle instability. Disorders possibly involving loss of the function of the ankle dorsi-flexors are: CVA, hernia, multiple sclerosis, post-polio syndrome, muscular dystrophy, spinal cord injury, polyneuropathy. Loss or lack of control of the calf muscles, moderate to severe spasticity, extreme pes equinus, foot deformity. The Push AFO is available in three sizes in a left and right execution. Place the foot at a 90-degree angle in relation to the lower leg, in order to measure the exact size. Firstly please measure the circumference around the heel and the instep of the foot as shown in the image above to give you a size in CM’s, secondly then see table to take your shoe size into account (Eur sizes) if your circumference measurement is on the border between 2 sizes or if you are currently suffering from a swollen foot. The Push AFO must at various points be adjusted to size by a fitting professional. Adjust the sole of the frame so it ends between the ball of the foot and the toes. The soft shell sole is also customisable. Keep it just slightly longer than the frame sole, so that the edge of the frame is well padded. To adjust the front closure to the right size, the removable end of the front closure should be taken off the front closure. Next the band must be cut to size with a pair of scissors and the end must be put back again. To prevent users with sensory loss over-tightening the straps, the attached setting indicators are to be applied to the loop strap at the back and at both sides of the orthosis. In this way the individual setting can easily be found every day.